Planning a get together with family and friends this Holy Month? Here are the expert tips and tricks to make sure your celebrations leave lasting memories. Whether you’re celebrating the Holy Month, or you’re looking to recognise friends and colleagues who are, there’s no question that Ramadan is the ideal time to bring loved ones together. Nonetheless, hosting a perfect celebration can be tricky, whether its knowing the right way to style your home, finding the perfect gift or ensuring that your iftar or suhour offering provides the perfect blend of taste and nutrition for those who’ve been fasting all day. Thankfully, when Good teamed up with Al-Futtaim Ace for a morning of Ramadan entertaining inspiration recently, our experts covered all those topics and more. ● Start with runners or placemats as a base for your table setting. They are a great way of adding colour while protecting your table from hot dishes and plates. Round placemats also help soften hard lines by adding curves to the space. ● Add height to your table setting by layering plates and bowls of different sizes. Mix and match crockery in various colours, patterns and styles to give a unique look – try combining your every day plates with some new ones bought especially for the occasion. ● Cutlery and glassware help add sparkle to your table. For extra shine you can include metallic serving dishes and accessories such a candle holders. Don’t be afraid to mix gold, silver and even rose accents for a glamorous, modern look. ● Don’t forget to add green! Flowers and plants make beautiful centrepieces but if you don’t have space then try tucking a sprig of greenery or single flower into each napkin holder. Your guests will appreciate your attention to detail. ● For added wow factor, decorate the rest of the room to match the theme of your table. 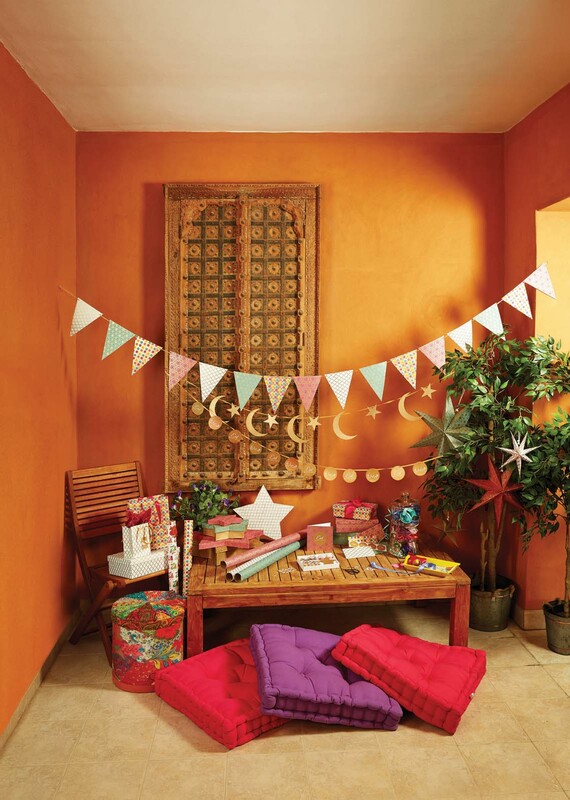 The Al-Futtaim Ace Eid collection has been colour co-ordinated so that all the hard work has been done for you! Chef proprietor at Dubai’s acclaimed 3 Fils, and former Good cover star, Akmal Anuar, understands the dining demands of the Holy Month well and will be fasting with his family. He lets us in on his top tips for planning an iftar or suhour feast that will satisfy every guest. What are the most important factors to take into account when planning a Ramadan menu? Ramadan is a special month for Muslims and after a whole day of fasting, food that is fresh and delicious is what comes to mind first. To break the fast, something soupy or sweet is always ideal. Light bites and a few leafy vegetables are great to start with too. ‎What should people bear in mind about the impact of fasting when it comes to planning an evening menu? Keep it simple, always simple. During Ramadan, you’re always facing a big-eye-small-stomach situation so something prepared the day before and ready to serve, such as a stew or a roast, is always good. How did you set about creating the dishes you presented at the Al-Futtaim Ace event, using Sirena tuna and Bega cheeses? I thought about what I want after a day of fasting. I like tasty and simply prepared dishes, ideally something that feels more like I’m snacking than having a big meal. Those are my favourite dishes. Tuna has great nutritional benefits and cheese is great for adding flavour to a wide variety of dishes, so I think incorporating them is a good approach and helps boost awareness of the importance of eating well, during Ramadan and always. If someone who isn’t fasting wishes to host their Muslim neighbours or friends during Ramadan, what are the key things they should be aware of when it comes to breaking the fast? Prepare some dates and a drink made with milk. Sweet snacks fill the stomach before the big meal, when breads and rice are always the usual choice. Why do you enjoy the Holy Month and what is your favourite thing about the traditions? It is a month to self-reflect, cleanse and think about others. Start giving, be charitable, exercise self-control, and remember it’s all about being patient and celebrating peace. Done right, it’s also a great time to lose weight.